1. Whisk the flours, cornmeal, baking powder, soda, sugar & salt in a large bowl. 2. Beat the eggs, buttermilk & oil in another bowl. 3. Stir the egg mixture and apples into the flour mixture until just combined. 4. 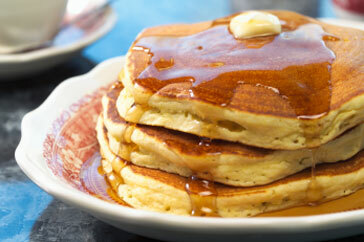 Heat oil in a large skillet over medium heat & cook pancakes for 5 minutes per side.